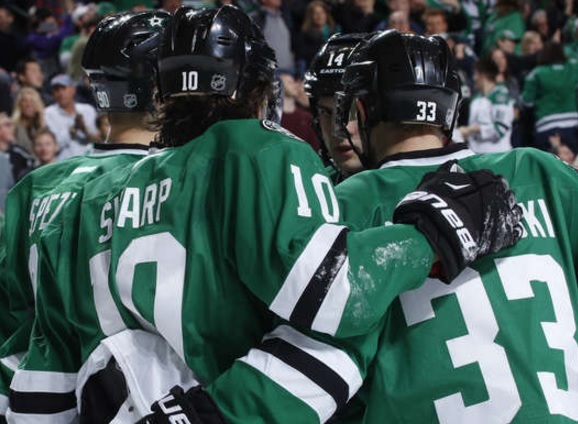 Former Chicago Blackhawks star Patrick Sharp had a goal and an assist for his new team and Kari Lehtonen made 22 saves to help the Stars to a 3-0 win against the Blues in Dallas on Sunday. It was the second of back-to-back games between these Central Division rivals. Sharp scored on the power play with 1:57 remaining in the first period after putting his own rebound past Blues goaltender Brian Elliott, who made 35 saves. Jamie Benn and Cody Eakin scored for Dallas (27-7-3). The Blues (22-12-4), beat Dallas 3-2 in a shootout on Saturday at Scotttrade Center, were shut out for the third time this season. Elliot made a great save in the second period with just over six minutes to play. The Blues were down 1-0 and getting outshot 22-9 when the Stars came down on the rush. Ales Hemsky had the short side of the net open when Elliot got his glove on a backhanded attempt that kept it a one goal game. Watch the replay courtesy of Fox Sports and NHL.com.